Tyler is an All Sports boy, my friends. He likes hockey, football, golf, frisbee, basketball, soccer, but especially baseball. 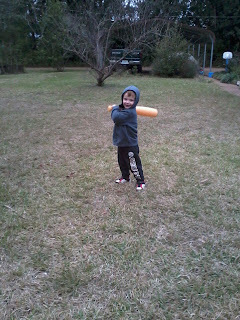 He got a tee stand and plastic bat set when he was a year old. He's only 21 months now, but he thinks he's ready for the major leagues already. He got a golf set then too (just the cheap $5 Walmart set) but that golf set has seen a lot of mileage. One club left, and it is a hockey stick, a pirate sword, an under the sofa ball retriever and any number of other things most days. But the golf set, the basketball hoop and soccer set cannot compare at all with baseball. This boy has never even been to a real game, but he loves it. Maybe in part because he's watched "the Sandlot" about 20 times. He could quote lines from the movie this past Spring. Anyone else have a 2 year old who tells you "You are Smalls, I'm Benny" when you go out to play? And he really does not want to use the tee. 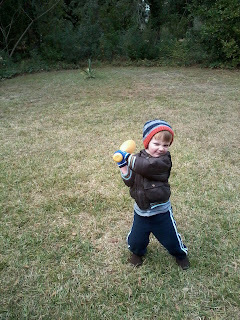 He wants to take turns pitching and batting. This weekend has been cold and windy and overcast, but that can't keep him from play. His pitch is very accurate, so look out, cause it might be coming at your head! Notice the pants? Go Steelers! He has a Steelers shirt under his hoodie jacket too. He told me this weekend "I like Polamalu! He's on the Defense!" He may not understand exactly what that means, but it has helped him accept that our #43 is not on the field all the time for a reason. It is so rewarding to be outside with a little one who is so enthusiastic about being active! I cannot wait til there are Little League games to go out to and cheer. No, I take that back. I can wait. He's growing up too fast already!